I decided to make a mutant Baby Pumpkin Monster in celebration of Hallowuino. 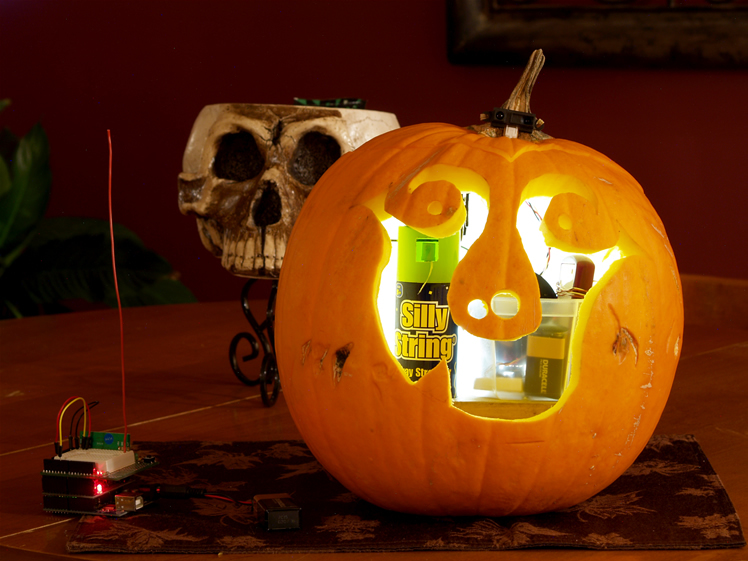 If you leave ze monster alone, it is a peaceful jack-o-latern. But, if you push his button, he will seek revenge. His eyes will switch from a yellow glow to flashing red, and his arms will swing with the intent to attack you. If I were to put this piece in gallery, there would be a spooky night background behind it, and a metal link chain would be wrapped around it making it look as if it is being restrained. There would also be a sign next to it that reads: “Beware of Monster: DO NOT PUSH HIS BUTTON”. For some reason it is a natural instinct for people to rebel and press the button in this case, thus making the piece interactive. 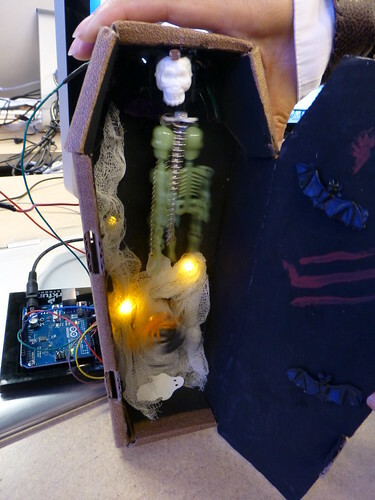 My project was the coffin box that was activated when the lid was opened! 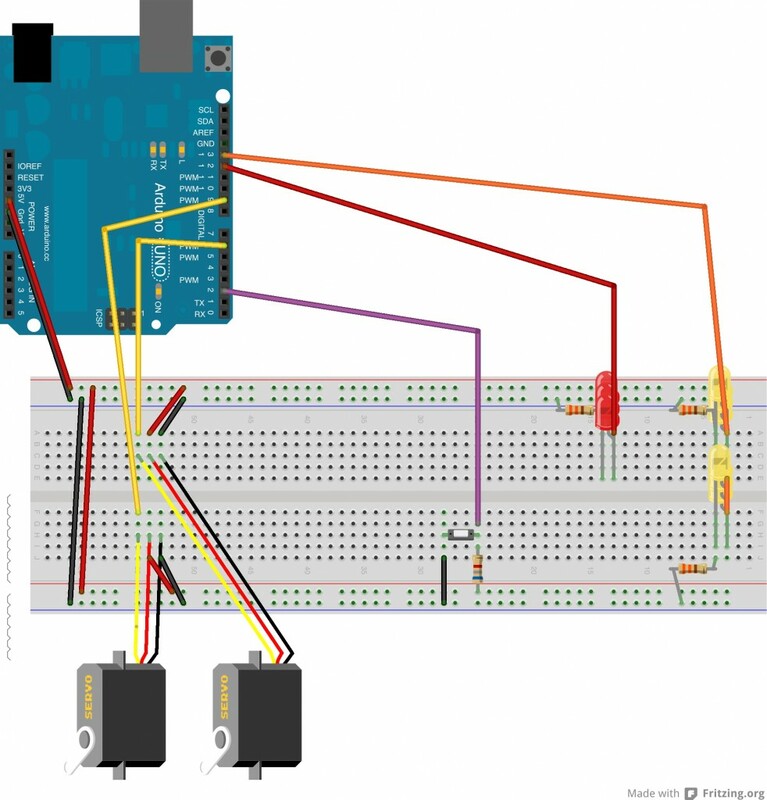 A photoresistor inside detected the increased light levels and turned on three pulsing LEDs, a randomly jittering servo motor, and a continuously spinning gear motor. I had two little skeleton toys and chains attached to the servo that would jiggle around when it moved, and there were two plastic spiders on the gear motor that circled each other on a web. The LEDs were diffused by the gauze spiderweb and two little ghost cutouts were entangled in it. This was an exciting project. I used one flex sensor, one motor and a servo. The action is activated by "hurting the mummy" - this means bending him in places he does not want to bend. This upsets the Mummy and as you hurt him, he begins to writhe in pain - flailing his arms as his head spins. I decided to make a creepy doll arm “graveyard” where the ground is made of (fake) fur. 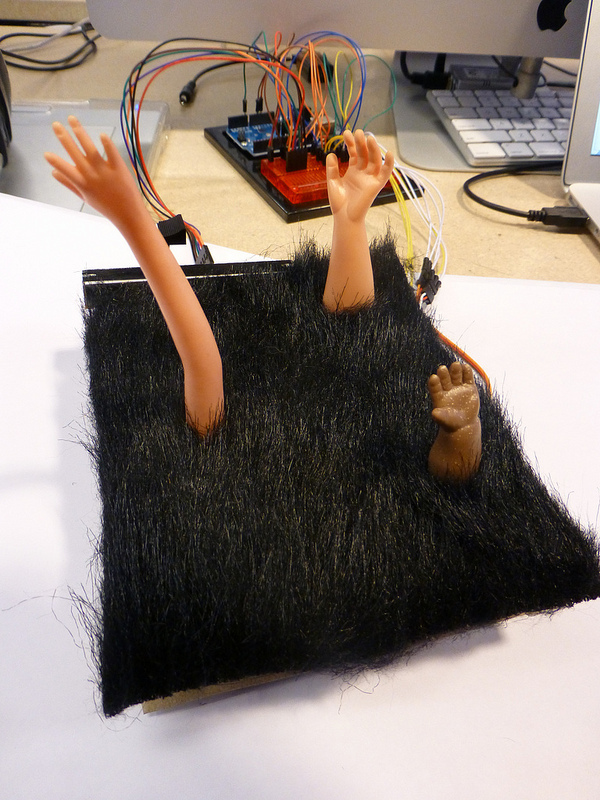 Three plastic doll arms are connected to Servo motors, and they rotate at a speed controlled by a sliding potentiometer. 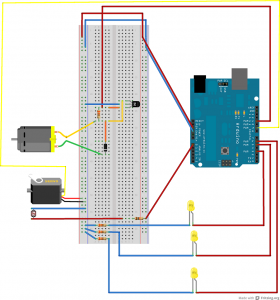 If the potentiometer is at its lowest value, the arms twitch instead of rotating. 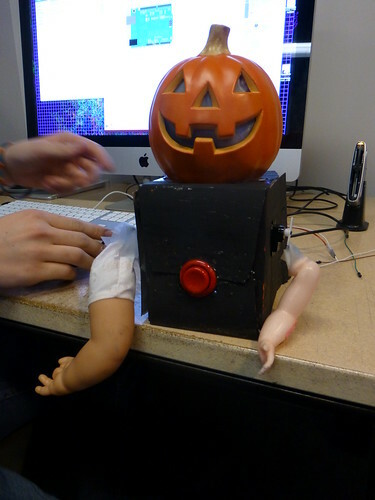 Due Wednesday, October 31: Use a 9V battery to create a standalone (i.e. not connected to the computer) Halloween prop. It can be part of a costume, or a modification of a commercially available decoration (if you wish). It should be spoooky! Shoot a video of the object in action; post it on YouTube and embed it in a blog post with the category Assignment-09. It should have at least one input: buttons, potentiometer, sensors…. 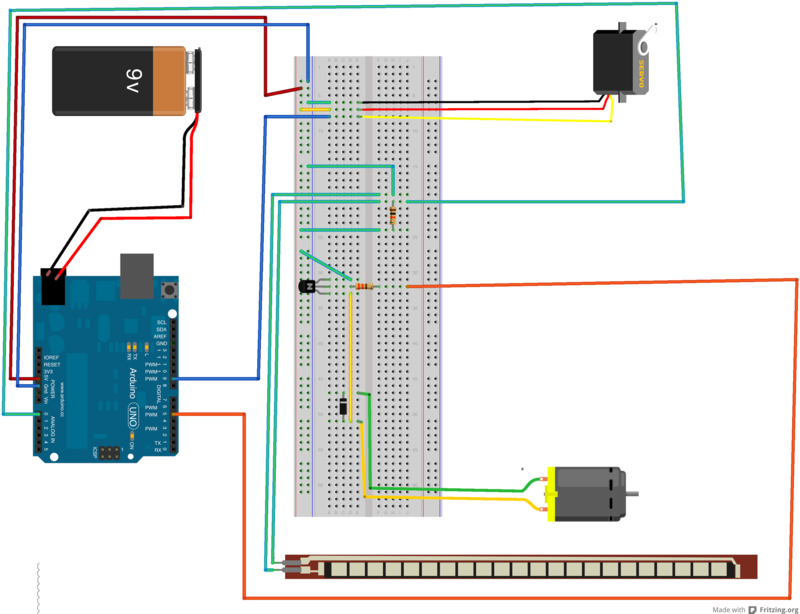 It should have some kind of output: LEDs and/or servo, etc. etc. It should work without a computer attached. 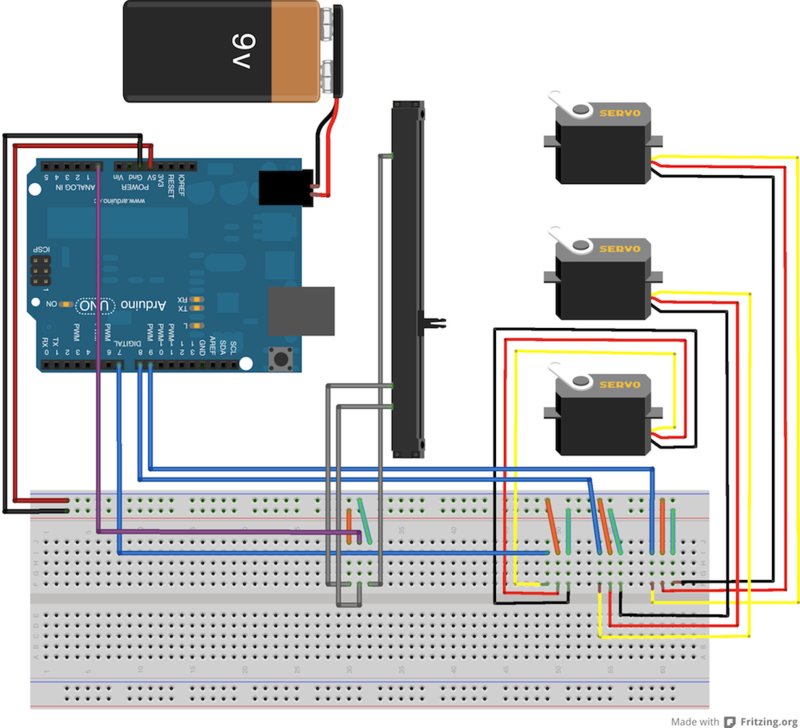 Program the Arduino, unplug the USB and plug the 9V cable. You can press the tiny reset button to restart the program. 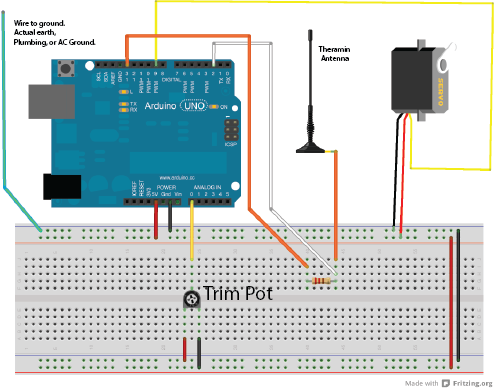 You can use alligator clips or wire extensions to separate Arduino + board from sensors and actuators. Here are the lights for the Knight Rider assignment!